The Museum's arachnid collections include the following orders: Acariformes, Amblypygi, Araneae, Opiliones, Palpigradi, Pseudoscorpionida, Ricinulei, Schizomida, Scorpiones, Solifugae and Thelyphonida. Nearly all of these are fluid-preserved, but there is a small collection of dried material of both type and non-type specimens. Most of this was acquired by J O Westwood and F W Hope in the 19th century, with a later addition of material from Octavius Pickard-Cambridge. The British Araneae collection has recently been rehoused and updated to modern checklist standards. Originally laid out in the late 1950s, and with identifications checked by both G H Lockett and A F Millidge, it now incorporates numerous small holdings of material donated to the collections over the intervening years. The majority of the material in the arachnid collection is historic in nature, although there is a growing amount of newer materials generated through fieldwork in Greece, Borneo, Bolivia, Honduras and other countries. The World Spider Collection has recently been created in order to hold these materials and other smaller donations not included in other parts of the collection. 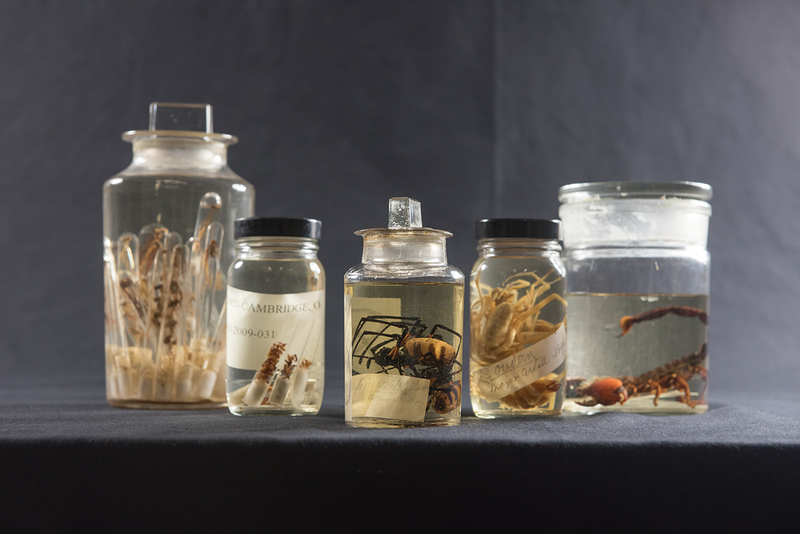 The collections are rich in type specimens, largely of Araneae due to the presence of the arachnological Octavius Pickard-Cambridge collection, which was donated by bequest in 1917. About 5,000 bottles of all sizes, holding up to 20 separate tubes each, comprise an almost complete British collection, and a very large collection of exotic species from every part of the world. It contains many hundreds of type specimens, not only those described by Pickard-Cambridge but others described by John Blackwell and a considerable number from eminent specialists such as E Simon, L Koch, W Kulczyński, R H Meade, G and E Peckham, and T Thorell. The Pickard-Cambridge library, bequeathed at the same time, consisted of about 140 bound volumes and a large number of pamphlets and offprints. Professor Poulton, then Curator, described the bequest as 'the greatest contribution to systematic zoology that the University had ever received by any one gift'. It is estimated that the exotic Araneae collection holds somewhere in the region of 250,000 specimens alone. Other significant holdings of Araneae include those of F O Pickard-Cambridge, J A L Cooke, G Lampel, T H Savory and R Gabriel.